Welcome to The American History and Genealogy Project (AHGP), an unincorporated not-for-profit network of independent sites devoted to History & Genealogy, and covering North American Countries and Territories. For more information about our group, including how you can join us, please see our about page. 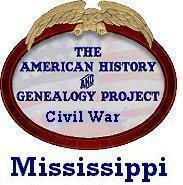 This site is a member of the American History and Genealogy Project - Mississippi Civil War. This site is an independent website of the American History and Genealogy Project and a state special project for the Civil War American History and Genealogy Project [see also: URL]. If you have records to contribute to this project, or you would like to host a AHGP - Mississippi Civil War county, please send the webmaster an email ahgpmscivilwar@gmail.com.